What are the different ways artists and photographers use the triptych format? What can a three part composition offer which a single image can’t? While the possibilities for composition and interpretation may be vast, I believe there are four broad categories which most triptychs will fall into. The first is the Three Part Narrative. Essentially the three images are telling a story – perhaps suggesting a beginning, middle, and an end. The three panels may show a distinct sequence of events, each contingent upon the other and the whole story is not fully revealed unless all three panels are included and viewed together. ‘Who ate the Tomato?’ is my light-hearted example of a triptych which tells a story. I must confess, my usual abstract triptychs don’t really fall into this particular category, but I certainly had a lot of fun playing with fruit! The second category is Transformation. These triptychs will often represent the passage of time or convey a symbolic meaning. I’m sure you’ve all seen the common approach of depicting a flower in its various stages of growth, each panel showing bud, bloom and its withering demise. In these we are presented with themes of life and death, decay and renewal, the transience of beauty and impermanence of life. 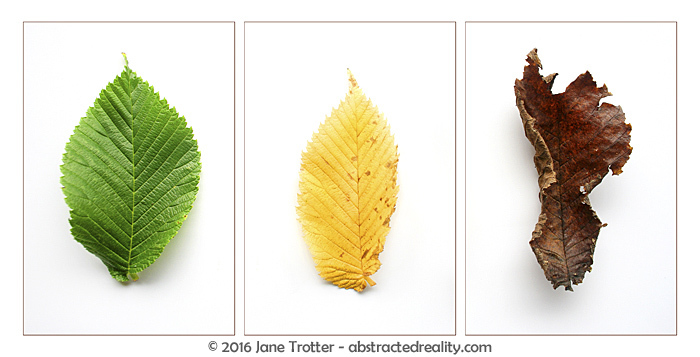 To illustrate this category I ventured underneath the magnificent elm tree in my front garden to gather the leaves for ‘Autumnal Meditation’. The third category I’ve called ‘Reconstruct to give New Meaning’. Offering a new and different visual perspective to the viewer, these images may use smaller parts of an object which are then recombined or juxtaposed in unusual ways. The viewer is then encouraged to look at and appreciate the subject matter in a completely different manner and to make connections which they hadn’t previously thought of. These images may also serve to isolate particular areas of a scene or subject, and by recombining, grant them greater or lesser prominence. 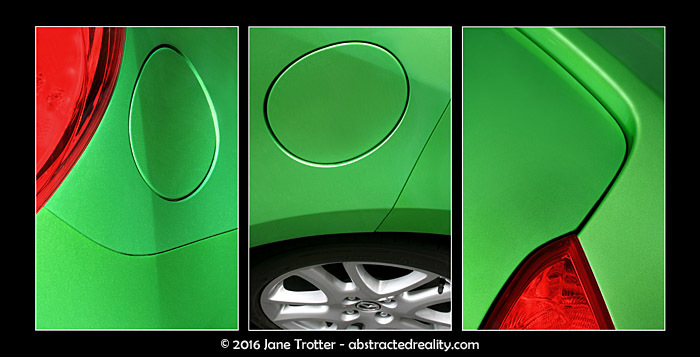 I call this triptych ‘My Mazda’. I literally had just finished cleaning and polishing the car (it doesn’t happen all that often!) and I thought it would be a good opportunity to do a photo shoot while it was looking pristine. I wanted to see if I could combine the minimalist lines and curves of the body work and lights into a coherent unit. Here you can see that the petrol cap has assumed a far greater significance in the images than it would have if you were looking at the car in its entirety. The final category is ‘Expand Visual Connections’. Sometimes, a single image isn’t enough to encapsulate or complete the whole visual conception of a work. In order to create the composition you want, you may need to think on a larger scale and broaden your canvas. 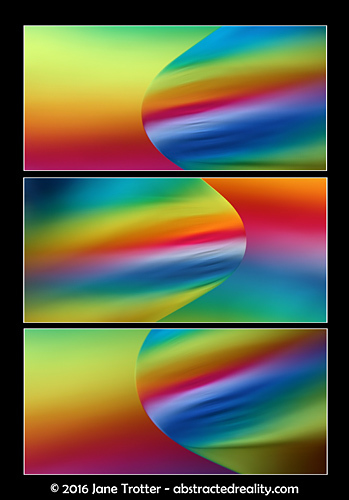 In this image, ‘Rainbow Surfing’, the only way I could achieve the effect of the continuous, undulating wave formation was to combine the three images. As my actual subject matter only had a single curve, I had to think on a broader scale and expand my vision, using several images in the construction to achieve the overall design. 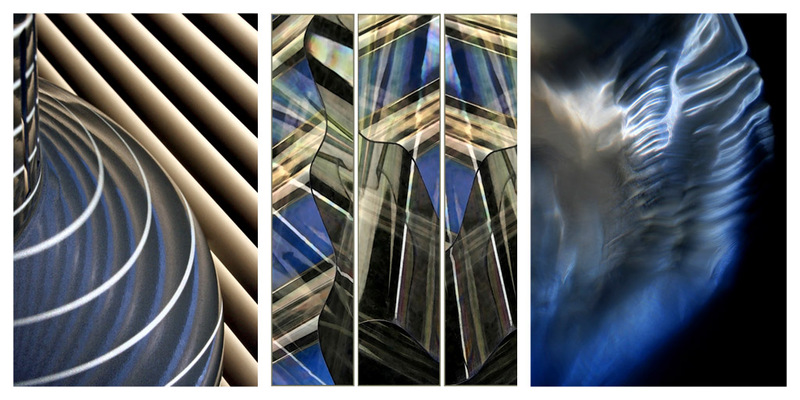 Almost all of my abstract triptychs fall into the last two categories. Thinking outside the square and experimenting with different combinations often results in equal measures of pleasure and frustration, but I do enjoy the ‘reconstruction’ process and encouraging new ways of looking at objects. More Triptychs to mull over! 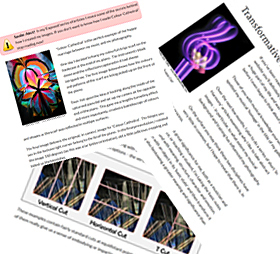 I have several other educational posts on triptychs if this article has piqued your interest. You can read ‘The Art of Creating a Triptych’, ‘How to Make a Triptych’ and ‘The Triptych Cut’ for more ideas and examples.